Collections are searchable via the Linen Hall’s catalogue and Digitised Collections. Visitors to the Linen Hall are very welcome and are free to browse our open shelves. For restricted access material, please register and present identification. 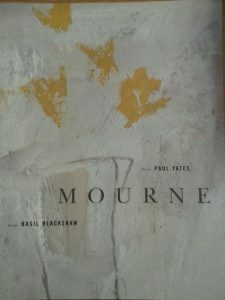 For access arrangements for archives and manuscripts, please email info@linenhall.com. As a membership Library the Linen Hall has an extensive general lending collection of fiction and non-fiction for the benefit of our members – with strengths in literary fiction, history, politics and arts and culture – it’s like having your own private library! The Linen Hall also has a great children and young adult’s library and is proud to hold an archive of the world-renowned children’s author Martin Waddell. Uniquely placed thanks to our history and heritage, the Linen Hall Library has an expansive Irish & Local Studies collection. Volumes of local history, fiction, plays and poetry line our shelves, as well as significant archives and manuscript holdings including: our own minutes and records of the Belfast Library and Society for Promoting Knowledge which is intrinsically linked to the story of Belfast, manuscripts compiled by Henry Joy (1754-1835), and literary archives, spanning Sir Samuel Ferguson, Louis MacNeice, and Joan Lingard (see also Northern Ireland Literary Archive for more). The archive of Michael McLaverty supports a biennial award to foster and encourage the short story and reflects the Linen Hall’s position as a repository for our literary heritage. 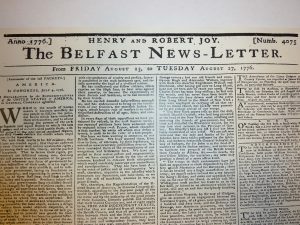 Our newspaper collection dates from 1738 with unparalleled holdings of the Belfast News Letter and a complete run of the Northern Star, the newspaper of the Society of United Irishmen, among the highlights, and the Irish & Local Studies offering is further enhanced by comprehensive periodical holdings, a map collection of note, and strong Irish language and Ulster-Scots collections, made up of historic and contemporary material, works of history, memoir, fiction, poetry and linguistics, as well as periodicals and offprints to encourage and support research and linguistic development. The Library has fantastic resources to support genealogy and the study of family histories attracting researchers locally and from around the world. From ‘how to’ guides for those beginning their genealogy journey, to gravestone inscriptions, military lists, passenger lists, lists of clergy, and information on surnames, place-names and street directories. Unique to the Linen Hall, the Blackwood Pedigrees of handwritten family trees and the Belfast News Letter Birth, Death and Marriage Index 1737-1863 are fascinating resources which are brought to life during our genealogy workshops. The Library has a comprehensive collection of early Belfast and provincial printing, and in this aspect, has benefited greatly from the benevolence of our membership. In particular, John Anderson, Honorary Secretary to the Library from 1873-1902, was a pioneer of local bibliography. His Catalogue of Early Belfast Printed Books (1887) is a treasure of the Library. The Provincial Printed Books collection includes the earliest printing from major centres such as Derry/Londonderry, Newry and Strabane. 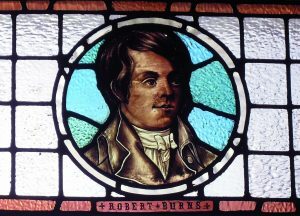 The Gibson Collection is the largest collection of material relating to Robert Burns outside of Scotland. Amassed by Andrew Gibson, a Governor of the Linen Hall, it was bought for the city of Belfast in 1901, and placed in the Library. The collection includes items donated by Burns’s grand daughter Eliza Everitt, and contains the first printing of Burns in Belfast (1787, James Magee), and copies of his own books. 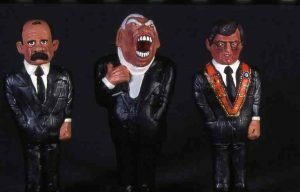 The final museum collection is the Northern Ireland Political Collection. In 1968 the then Librarian Jimmy Vitty was handed a civil rights leaflet in the city centre. He kept it and brought it back to the Library. Since then the Linen Hall has sought to collect all printed material relating to the ‘troubles’ and peace process. You can view digitised sections of this collection at: Divided Society. The collection has grown to some 350,000 items including books, pamphlets, leaflets, posters, manifestos, press releases and cuttings, audio-visual material and periodicals, encompassing all shades of opinion. Political and social archives include that of the Northern Ireland Civil Rights Association, the Northern Ireland Women’s Rights Association, the Peace People, and the Northern Ireland Women’s Coalition archives. A living collection which is added to by acquisition and donation, it is a definitive archive of national and international significance. 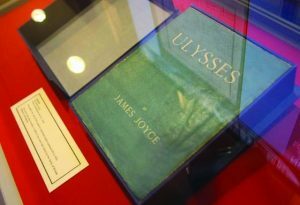 The Linen Hall’s Theatre & Performing Arts archive is the primary source for theatrical material from Northern Ireland. 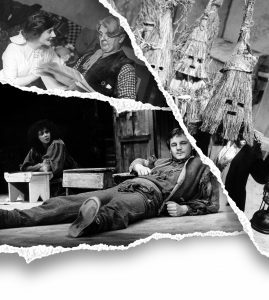 Our collection ranges from 18th century playscripts to promotional material for current productions, and comprises thousands of programmes (visit digitised archive at: Digital Theatre Archive, handbills, posters, photographs, cuttings and holdings of unpublished scripts. It houses archives of playwrights such as John Boyd, Stewart Parker, and Christina Reid, as well as ground-breaking local theatre companies such as Charabanc and Tinderbox. Throughout our history, donations of books and collections by Members and friends has been crucial in making the Linen Hall Library the unique resource it is. We continue to welcome donations in line with the Library’s collection policy. Potential donors should be aware that we are only able to accept items which are core to the collections as outright gifts, and we require the right to dispose. 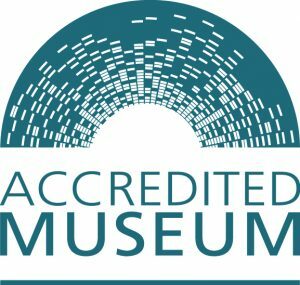 All donations to the collections will be acknowledged and donors listed in the Library’s annual report.